ADI has undertaken undercover investigations in circuses all over the world and our studies show that life for animals in circuses is one of deprivation and suffering. In 2012 the British Government promised to ban the use of wild animals in circuses. Despite draft legislation published the following year, with an implementation date of 1 December 2015. Despite repeated promises of action, this law has yet to pass with the latest commitment to bring in the ban by January 2020. Scotland - the Scottish Parliament unanimously voted through the bill to ban wild animals in travelling circuses in 2017 which will now become law. Ireland - the Irish Government adopted regulations banning the use of wild animals in circuses, effective 1 January 2018. Write to your MP / MLA / AM or local councillor and ask them to support a ban on the use of animals in circuses. If you need their contact details, just let us know. 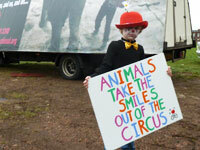 Please help highlight circus suffering when an animal circus comes to town! Order our free ‘Stop Circus Suffering’ leaflets and distribute them in your town. Even taking 20 and delivering them through letter boxes or taking them to your local library or vets practice will help. Have an information stall in your town centre. ADI can provide you with materials and loan you (free) a ‘Stop Circus Suffering’ banner for the table. Take part in a demo. ADI can help organise this with you. We can put you in touch with other supporters in your area and provide you with all the materials you will need. Write to your local paper to let readers know why you don’t want to see animals in circuses where you live. Get political. Write to your MP / MLA / AM or local councillor and ask them to support a ban on the use of animals in circuses. If you need their contact details, just let us know. Go wild! Hold a leafleting session in your town with your friends and family dressed up as animals, with a ringmaster or ringmistress. ADI can contact your local media and help you organise a photo call to raise awareness that the circus is coming and why people should boycott the show. An Evening with Lions and Tigers - not presently touring, but performed in Wales during 2015 with lions and tigers, owned by Thomas Chipperfield.